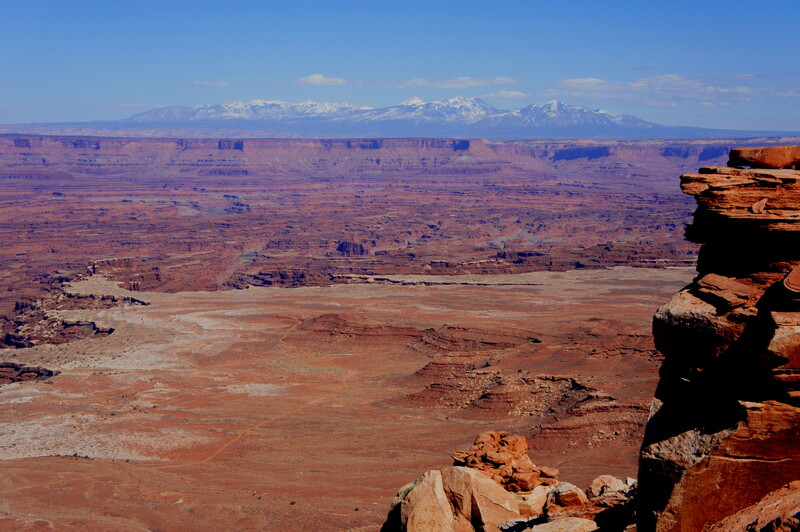 Though just up the road from Grand View Point in Canyonlands National Park’s Island in the Sky District, the White Rim Overlook Trail receives far fewer visitors. 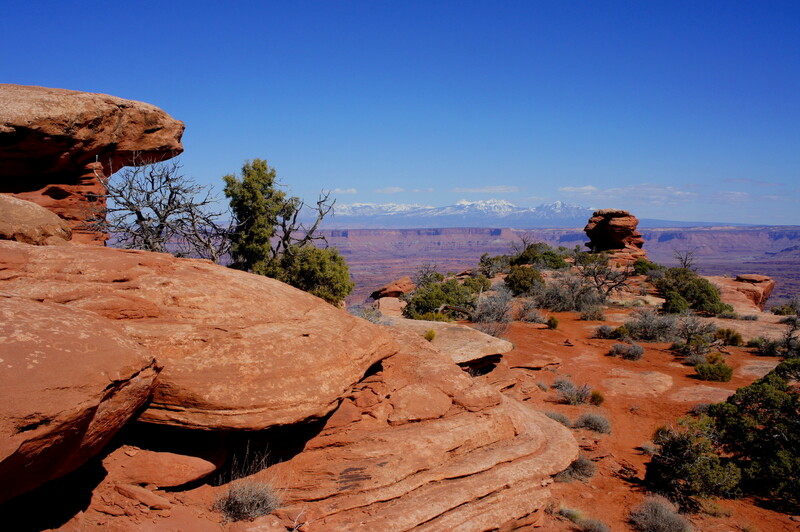 The hike, an easy and quick jaunt out to the southeast tip of the “Island” plateau, offers unobstructed vistas to the north, south, and east—some of the best in Canyonlands. Of particular interest are Monument Basin and Gooseberry Canyon, situated more than 1,500 feet below the brim of the Wingate sandstone cliffs on which the overlook sits. To access the White Rim Overlook Trailhead, drive roughly 11.5 miles south on the Island in the Sky Road, turning left onto the marked, one-way turnoff. 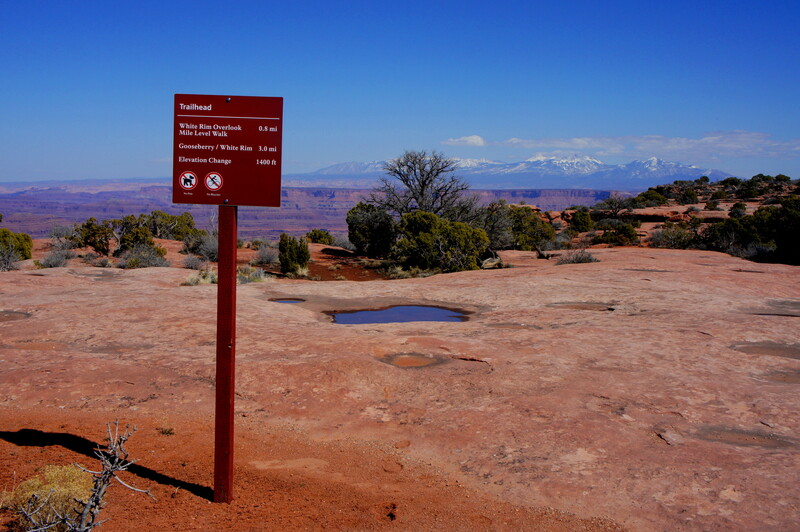 The trail begins by traversing a sun-soaked, slickrock basin pockmarked with potholes, some of which may bear water. After 1/10 mile, the trail forks—those venturing down the steep and demanding Gooseberry Trail will bear left; all other will stay right. 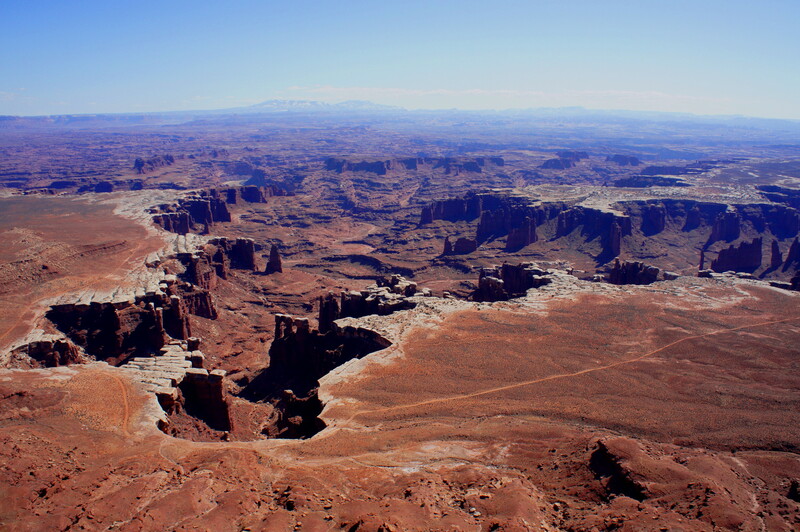 From here, the White Rim Overlook route bears southeast across a mixture of slickrock (Kayenta formation) and ruddy dirt. A small ridge of ledgey Kayenta takes form to the left. Vegetation is relatively dense for the area, composed principally of junipers, pinyon pines, a variety of sagebrush, and species of ephedra. The relatively level trail (mostly free of steps) ends at a pair of striated knobs at the tip of the promontory. It is possible to pass by both to the very edge of the point, but use extreme caution to avoid a very unfortunately tumble of nearly 1,000 feet. Keep an eye out as well for moqui marbles, one of Utah’s most peculiar geological features. 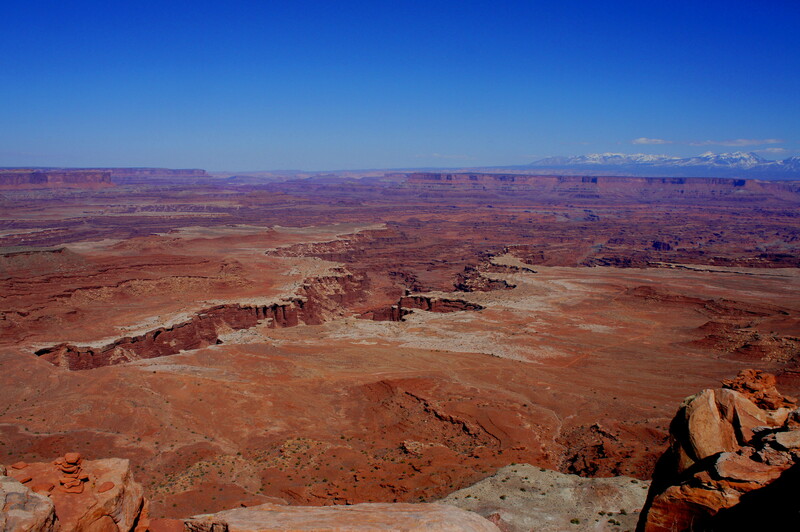 The panorama from the White Rim Overlook is spectacular. To the north, a seemingly endless line of red-orange Wingate sandstone cliffs fills the frame. Below the White Rim—the flat expanse marking the half-way point down to the Colorado River—a series of canyons have cut deep into the sandstone. The most apparently visible to the north is Gooseberry Canyon; to the south, Monument Basin. Both feature steep cliffsides of deep red Organ Rock shale as well as a smattering of spires. You can also score a peek at the muddy Colorado to the southeast (at the end of Monument Basin) as well as capture much of the Needles District and the La Sal Mountains in the distance. Return the way you came. Allot at least an hour for the round-trip. This entry was posted in Canyonlands National Park, Easy Hikes, Utah and tagged Canyonlands, Colorado River, Gooseberry Canyon, Island in the Sky, Kayenta formation, Monument Basin, Utah, White Rim, White Rim Overlook, Wingate sandstone. Bookmark the permalink.